Donned in her evening gown, her earrings swinging, she clutched her… clutch, walking determinedly in her high heels though they slipped in the sand. She could hear the Bedouin camp’s music, the smell of musky incense drawing her in as she came closer. She held her phone to her heart, her only resource to secretly document every manoeuver, mistake and perfection. Finally, she pulled back the silken flaps of the camp, heavy gold cords holding them loosely shut to immerse herself in the world of rich wines and exotic foods. Ok, no, I was not wearing an evening gown or high heels (though I was wearing nice earrings :D) nor did I tramp through any sand and pull back curtains on a tent. 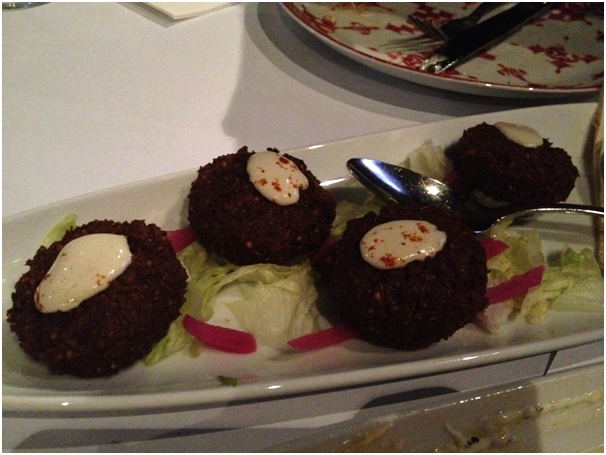 **Note: I apologise in advance for the lack of lighting in photos, especially for my brother’s dish and the falafels! On arrival to Kazbah, we were surprisingly early even though it was 7pm booking. Dimly lit lights, a very Moroccan-Persian style mix of an interior, with silk curtains leading to an entertainment area, a Hookah casually sitting and the atmosphere actually made you want to relax and fine dine.There was also soft, Turkish music playing in the background, setting the mood even more. All in all, the interior was just very impressive. On being seated, I loved that each plate was a different style, adding a little warmth to the dinner table as opposed to clean cut, pristine white plates. There was a candle, of course, and crayons to draw with on the huge paper-but-feels-silky table cloth. It is definitely a huge plus! Or should I say drinks? The whole evening, one of my main points of fascination was the stunning jug. Calling it a jug makes me want to hurl, it was so beautiful. So I will call it a pitcher. Not much better but it will do. We would have bought one but they were unluckily out of stock. It is so on my shopping list! 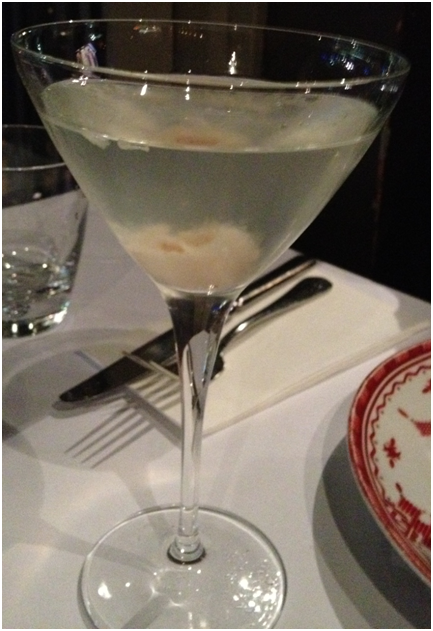 Dad opted for the Lychee Martini. A mixture of vodka, lychee liqueur and lychee juice, it was sweet and slightly pungent but with a fabulous kick at the end. How do I know this? Because I took one sip (with permission!) 🙂 – I also loved the little lychee lying at the bottom of the glass! Mum, she went all out for the Strawberry Mint. 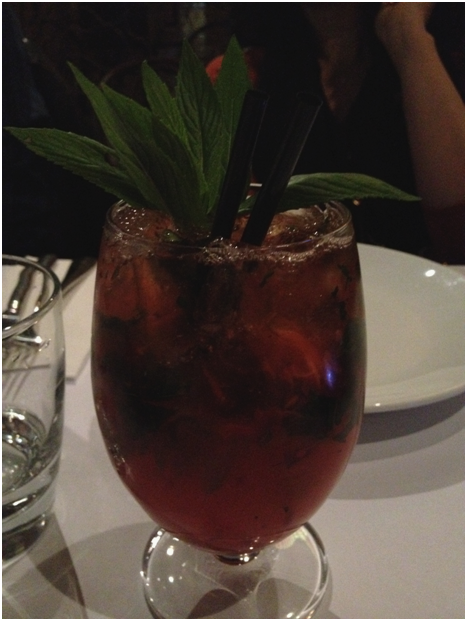 This was a combination of strawberries, mint (no joke), strawberry liqueur and crushed lemonade. Definitely my favourite (oops ;)), it had a lovely aftertaste and obviously my mum enjoyed it so much, she even ate the mint leaves! We had four different ones to get a taste of each. 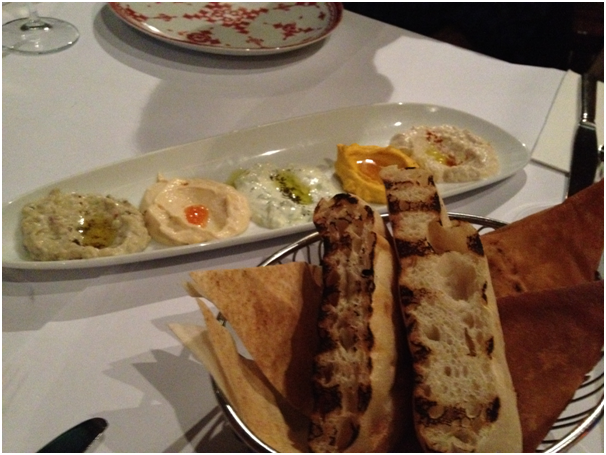 Firstly, the traditional Dips and Bread plate. We got maybe four or five different varieties of bread – toasted, grilled, fried, soft. It was all there. And with five beautifully presented dips. Without a doubt, everyone dug into the Babaganoush with gusto and the hummus, though my personal favourite was the Tzatziki which was very refreshing. 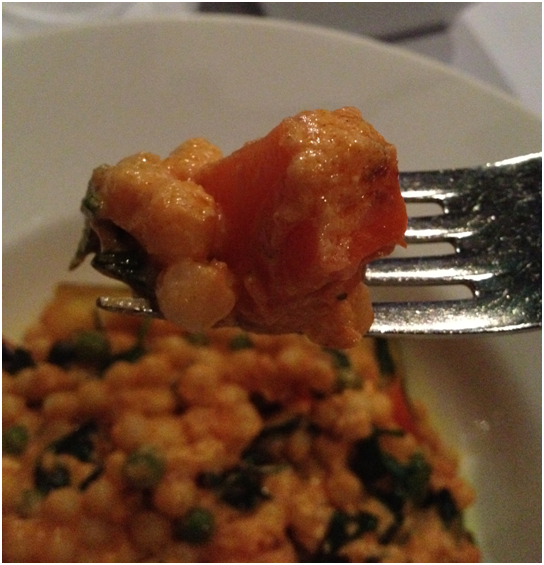 There was also Carrot and Taramsalta (which contained fish). 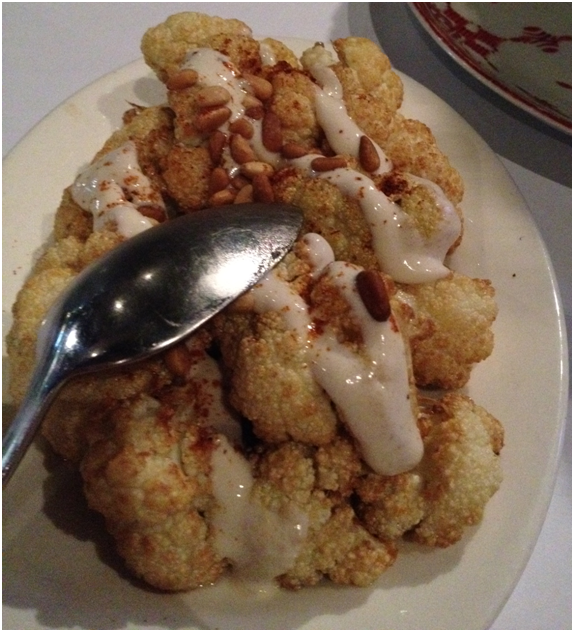 Then came the Fried Cauliflower. It was soft on the inside, but perfectly crunchy on the outside, lying on a bed of eggplant jam which was so delicious, it melted my insides and went perfectly with the vegetables. Beautiful fried, with no hint of over-oiliness, these were exquisite, the hummus and lettuce with pickled onions acting as the perfect side. 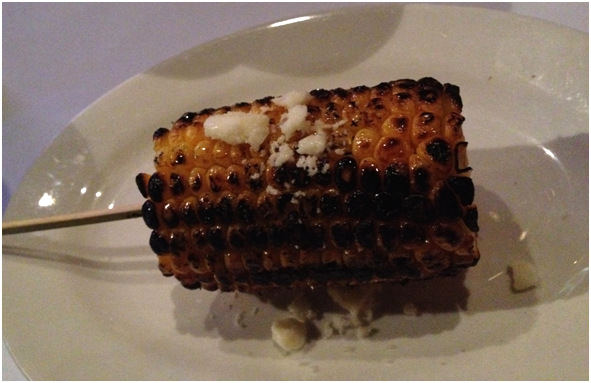 Lastly, we ordered corn on cob gone gorgeous. 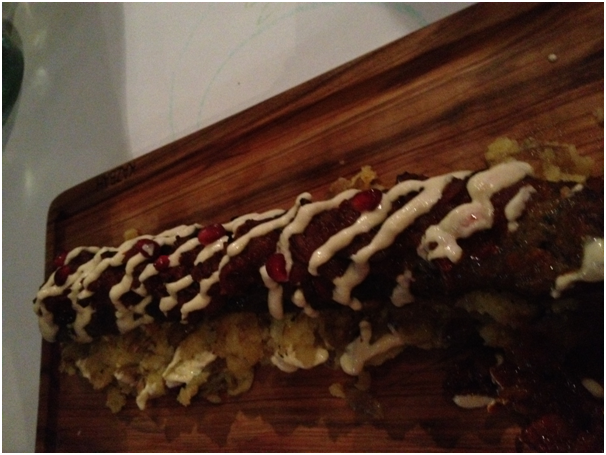 It was char-grilled with their own exotic butter and rolled in Haloumi cheese pieces. The flavour just burst in every bite and I could actually eat it forever if I desired. Now the mains. 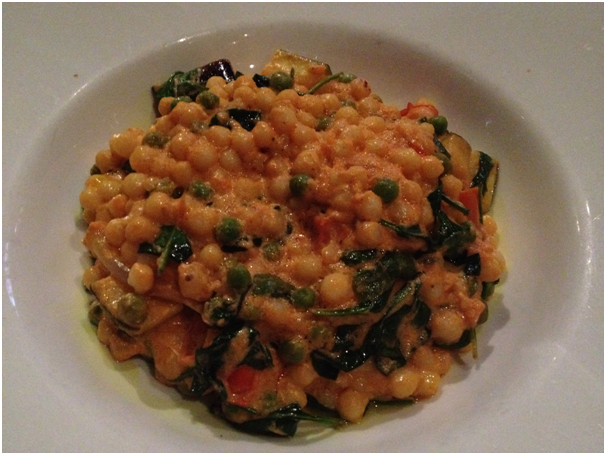 Although not a ton of vegetarian variety, the dishes they had were more than enough. And perfect. I ordered the Mougrabieh of Roast Vegetables with Creamed Feta and Olive Tapenade. Oh. My. God. Not to get all Janice-like on you but one bite had me literally over the moon. The feta and tapenade (and this is with me, a hater of olives) was impeccable, giving a beautiful saltiness to the roasted vegetables. So creamy, so perfectly made and delicious. 11/10. No joke. My brother ordered the Lamb Kafta kebabs, because according to him, you cannot go to a Turkish restaurant and have kebabs without lamb 😛 He claims that the meat was cooked perfectly, dry but tender the way he likes it. This was served on garlic crushed mashed potatoes *drools* and olive chackchouka, drizzled with hummus sauce. 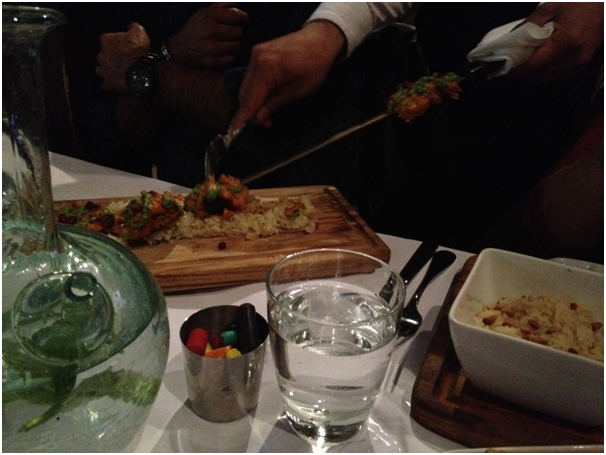 I loved how the waiter/ress actually took the pieces of the skewer for you – absolute and utter class! Inspired by this amazing dinner, I decided to try and make a Turkish specialty that my dad, my brother and I find unbeatable. Now, I had had this recipe sitting in my closet for 2 months eons and decided that enough was enough, perfect time to try it, so let’s do it. 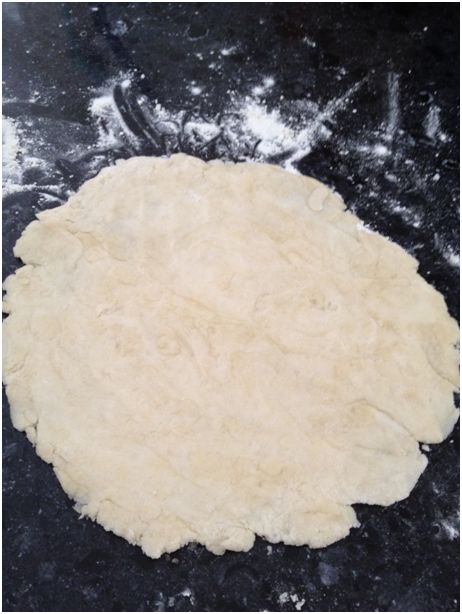 But looking closer at the photo given with it, it was not a gözleme. 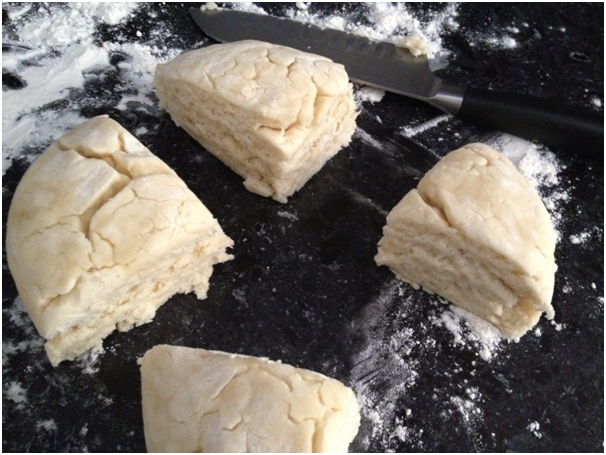 Oh no, gözlemes are stuffed inside, then rolled out thinly before being drizzled in oil, cooked on a griddle and then chopped into triangles, squirted with lemon. Squirt with a lemon wedge or two and dig in! Still no dessert? Well not really much but I remade a batch of my secret Choc Chip Uru Chocolate Chip Cookie recipe but with white chocolate chunks and macadamias – check out the pictures, these cookies are undoubtedly the best! A good note to say good night on my friends! Love the restaurant! 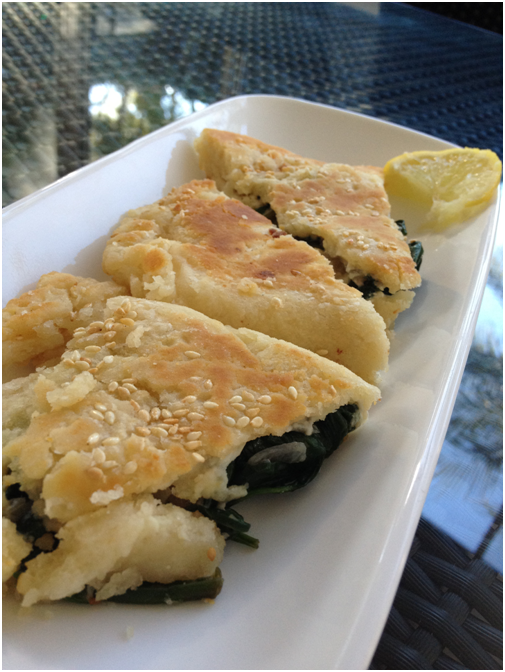 Love the feta cheese and spinach pide, and of course your cookies! 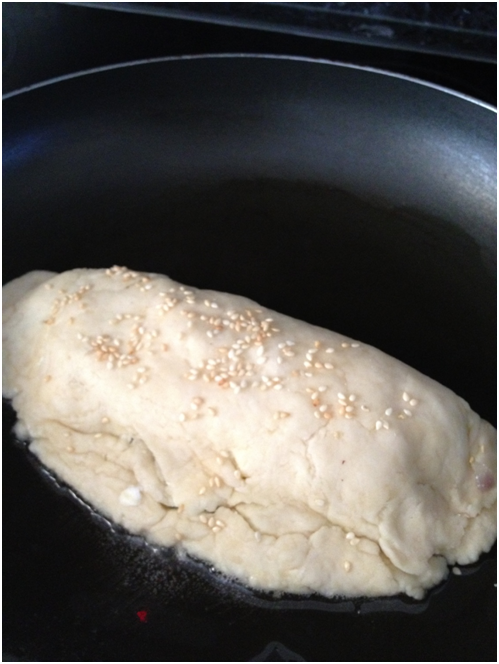 Seriiously the Spinach & Cheese Pide should be gracing my table right now, it looks so good. Yesterday the Mr. and I were discussing places we’d like to visit. Morroco has been high on my list for ages. I was also thinking of doing a Morrocan tablescape. Very timely indeed. Wonderful post. I enjoyed this post, great job! Oh my….seriously delicious food. All of it…especially your Gozleme. I need one of those…no wait…10 of those. Better. Oh. My. Goodness. I would love that restaurant! Thanks for sharing the video! It is nice! Also thanks for sharing the tips of cooking! nice ones! I want it all! The spinach and cheese pocket, the fried cauliflower, the minty drink…ALL of it! This seems like a spanikopita. I love those. I am sure I would love this…it looks yummy, and healthy. Ummm these are beautiful and wonderful. 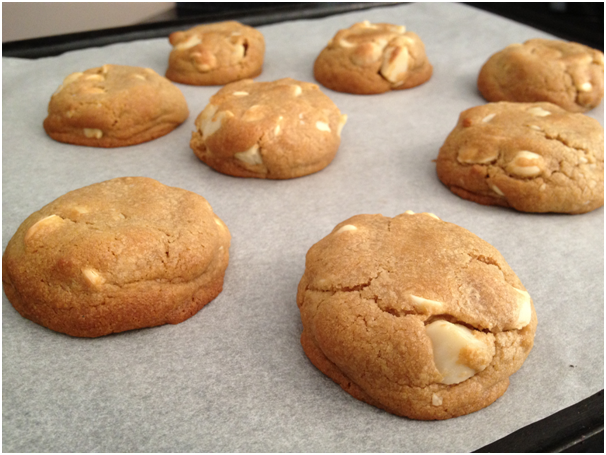 Everything about these cookies (ok…minu white choc. 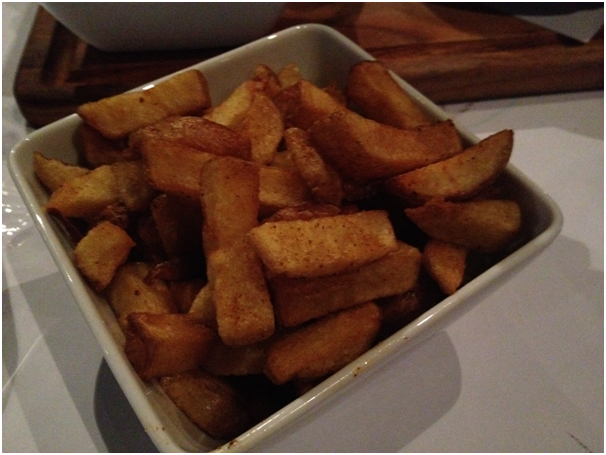 chips, but I could totally replace those with dark choc.) I love! I’ve got to stop reading your wonderful posts so I can write my own reviews of Royal Taj, one of the many places we’ve eaten out on my vacation. I’m so-o groggy after consuming their scrumptious Indian food. Anyway, CCU, you are my idol. Great photos, great words, great foods. Oh my! Where to start! There’s so much deliciousness in this post!!! What a delicious meal you had and I am impressed with your pastries! They look delicious. Such a beautiful spread! Hungry now 🙂 I must get me one of those pitchers – stylish and practical! Looks like my kind of place! It’s been so long since I’ve had really good falafel at a sit-down restaurant. I wish this were nearby. Your evening out with your family looked and sounded wonderful! 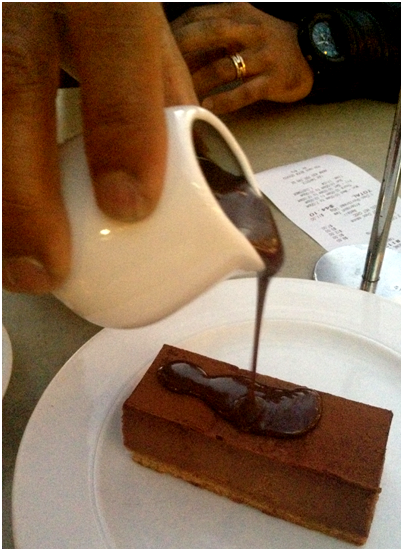 What a lovely post and what lovely desserts you created. Great review CCU. And that cookie recipe looks delish! 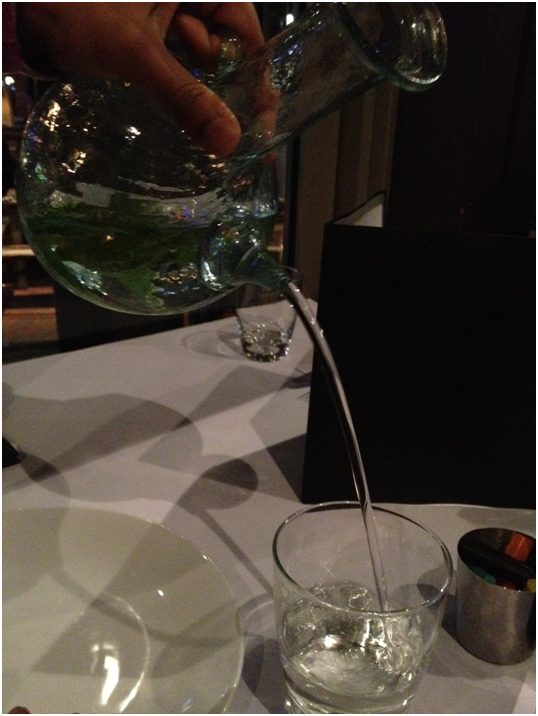 Wow Uru what an amazing dining experience – I too LOVED the different plates on the table and the water pitcher, so neat! The entire meal from start to finish looked first class, thanks for sharing this review – I love these posts! 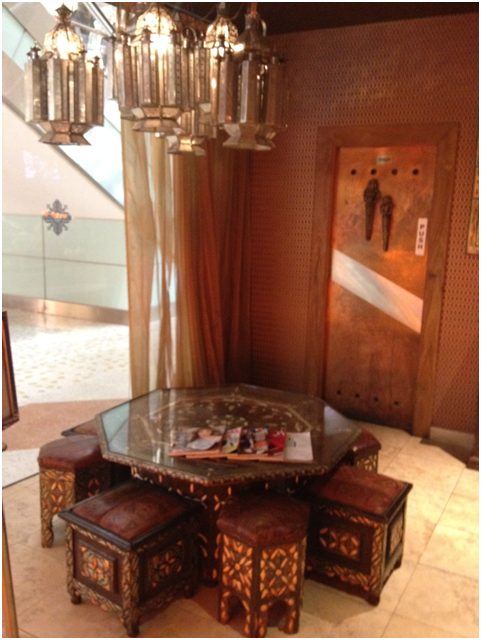 Beautiful deco and wonderful spread of food, from the mint drink and all of the rest too. ooh, this meal sounds amazing! i love mediterranean food + everything you got, plus the drinks, look wonderful! i could sooo go for the mezzo plate right now. yum! Middle eastern restaurants are always a wonderful place to visit. I like their decor and great food. The water jug in the picture is interesting. 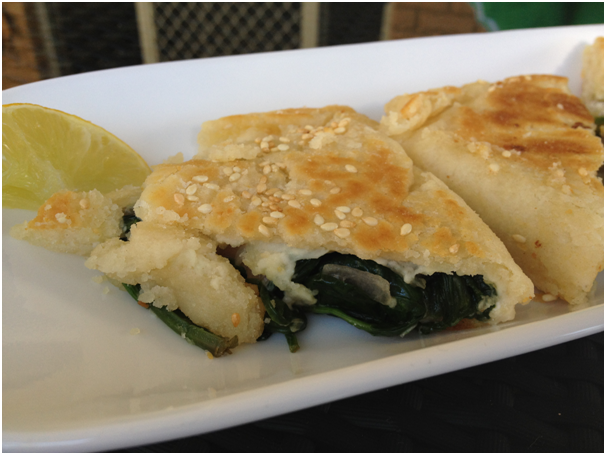 the cookies and the spinach feta pide looks delicious. Have a great day my friend! I love to see dishes inspired by restaurant adventures. You did a great job!! That is a lot of yummy-looking food. 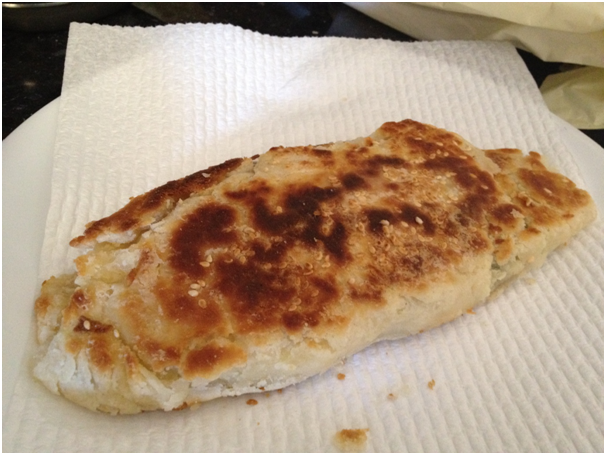 And kudos for making your own gozleme, though I am sad that you don’t like mushrooms, it looks great! What a lovely lovely lovely meal and a delicious dish inspired by it! Nice post! Your photos are marvelous and I would love that plate of fried cauliflower! Your fried pastry looks delicious, as do your cc cookies! 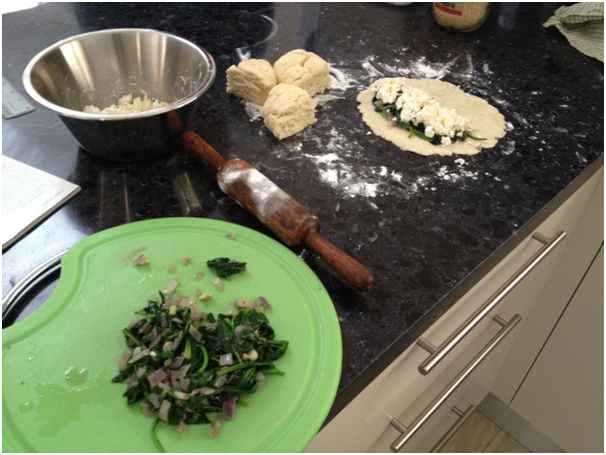 Thanks for the Gozleme Wannabe – Spinach & Feta Pide recipe. 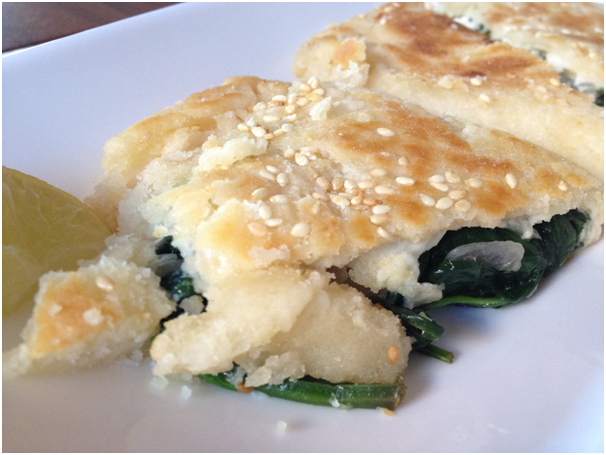 If you don’t mind, can you submit your Gozleme Wannabe – Spinach & Feta Pide photo in http://www.foodporn.net ? I will reply to your comment again when I have! It is true, mine was a little thick but not considerably but it definitely used a lot of oil! Really nice review! Sounds like your whole family had a terrific time. But I have to recover from fainting – first you had no dessert, then you have us a savory recipe?!!! Are you feeling quite well? 😉 Good thing you finished with photos of cookies! Thanks for sharing the recipes…they both look delicious! Do I see a future job in restaurant criticism? Great review! 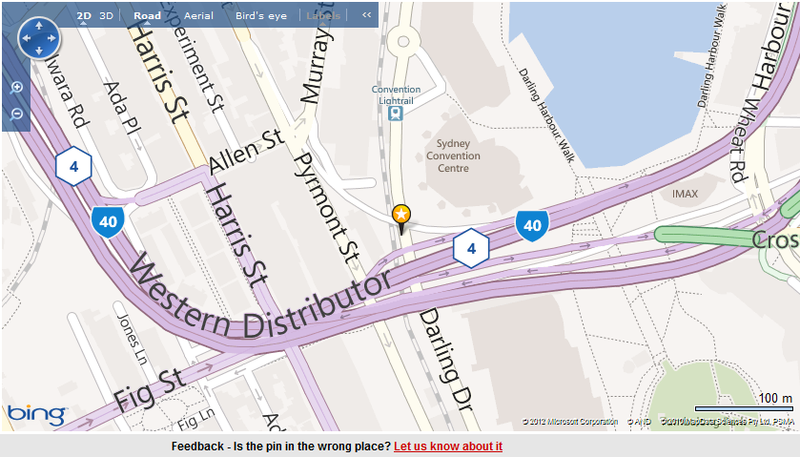 Oh Uru, that restaurant looks amazing. I’m loving the Morrocan theme and different plates too. All the meals look amazing. I bet the cremed feta was awesome. 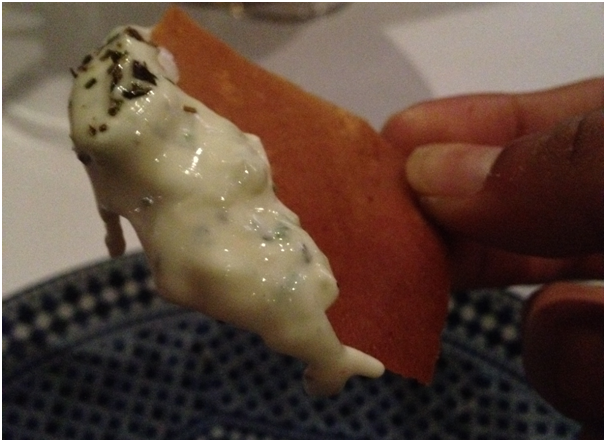 I love feta, and Tzatziki too. 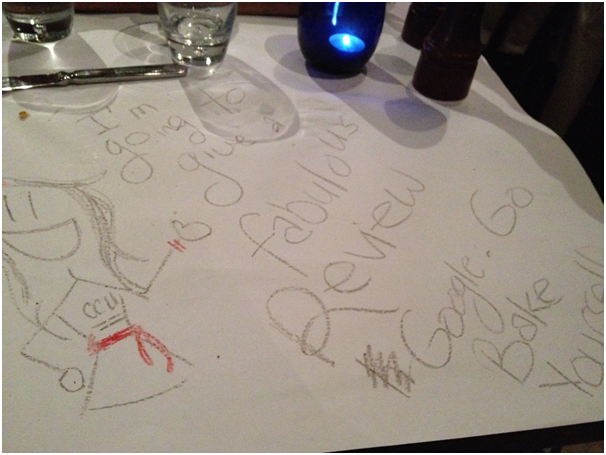 The writing on the tablecloth with the review made me chuckle. I wonder if they’ll be visiting here to check that out? Hehe. Great job, CCU undercover, once again revealing some great restaurant vibe, wine ( water for you) and dine. I love going through your prosed up reviews. And that enveloped goodness you made at the end, what was it- gosleme- I’ve never tried it, but as usual think I sense the need. My lazy self however pales in comparison to you , Ms. Superblogger and hopefully I get around to making some of your yumminess soooon. Wonderful read again, my friend. 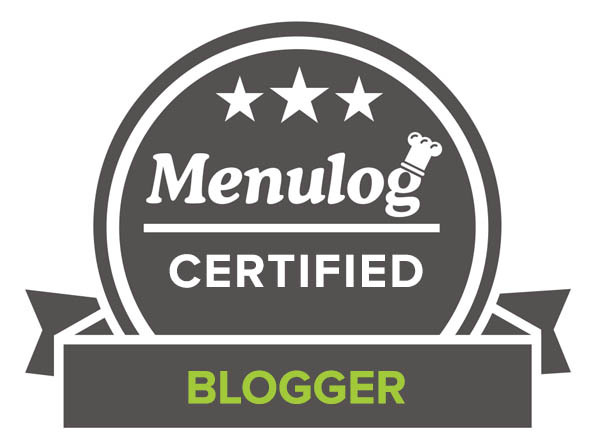 Everytime I visit your blog, I melt and my stomach growls! First of all, I love the introduction to this post! And now I have food envy, sigh. I really want that fried cauliflower. Oh my goodness, what a feast! 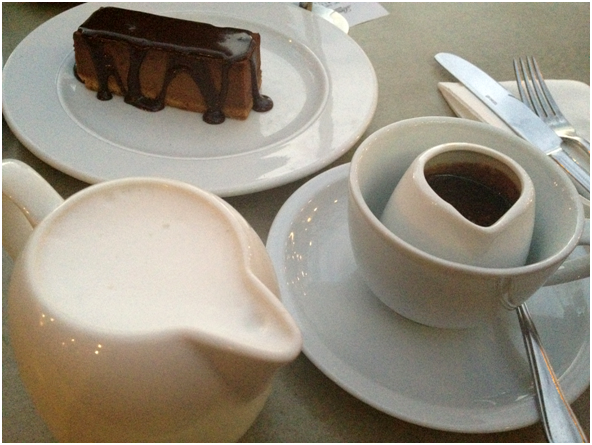 Velour Chocolate Cheesecake and Hazelnut Hot Chocolate would make my day. And that spinach pie looks delicious. That restaurant guys should give you a special dinner for your and your family. You did a wonderful review. 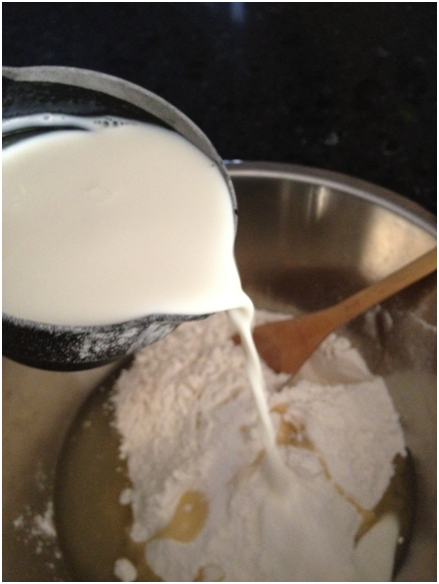 I love to make your secret white chocochip cookie. It sounds like your family had a wonderful experience. I wish the lighting had been better to get more of a look at those dishes but I know you were limited by the natural light available and you did a splendid job under those conditions. The experience was worth every penny spent, I’m sure. After all that, I was ready for a break to digest, figuratively, but then you threw two recipes at us. My favourite was the spinach and cheese pide. I’ve heard the name somewhere but can’t recall exactly where. I’m going to take a closer look at the recipe and see what I can do for the future as I’ve never cooked a Turkish/middle eastern menu and would like to do a proper one. Looking forward to your future restaurant reviews. I hope you try it out my friend, it is a wonder I have not made and eaten this before, it was absolutely gorgeous! Another winning discovery! 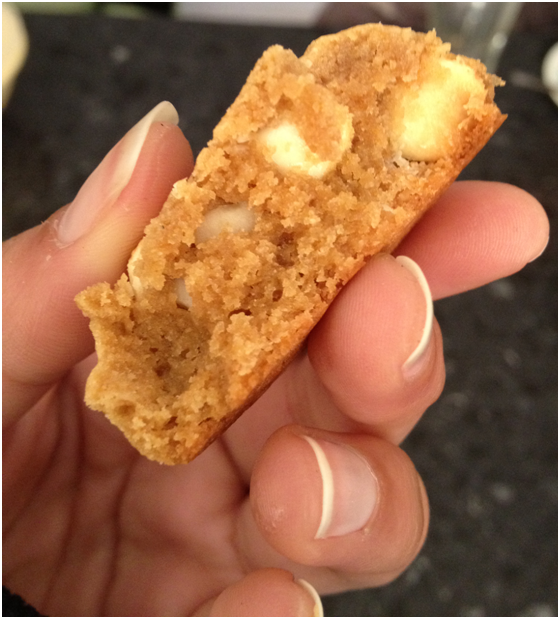 Love the gozleme and LOVE your chocolate chip cookies – that’s what I put in my blondies – white chocolate and macadamia nuts! Great minds and all that! 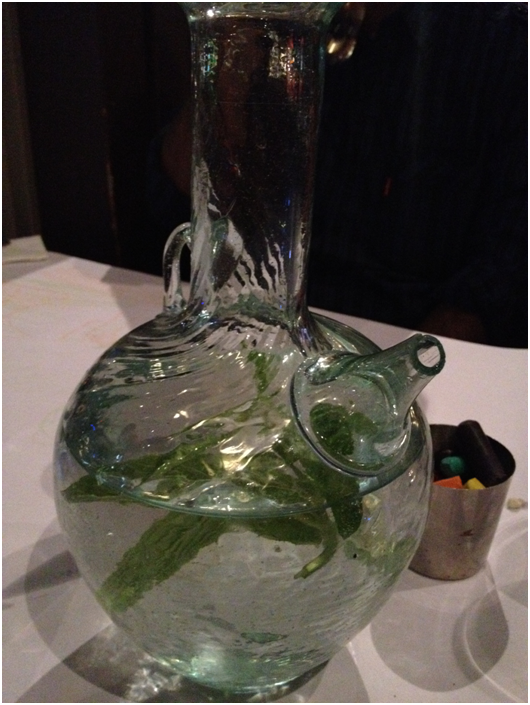 Love the pitcher, btw, it’s called a porron, it’s Spanish and is used for sharing wine in a group! Love your restaurant reviews. Once again I’ll go with your Dad’s or brother’s dish, yum! I’ll take your Mum’s drink though 🙂 I wouldn’t have been able to look at dessert after all that food! The gozeleme wannabe looks delicious. What a great restaurant review and delicious foods. That spinach and pide has my name on it. 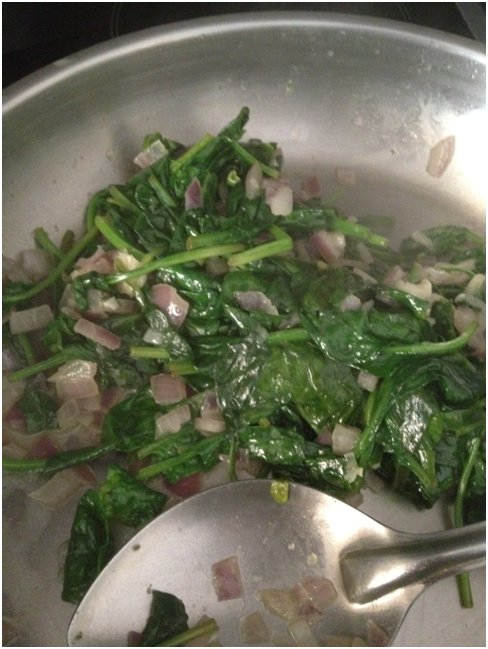 I am going to be making this, stuffed spinach anything is one of my favorite treats. I call savory treats, LOL. Wonderful recipe my friend. 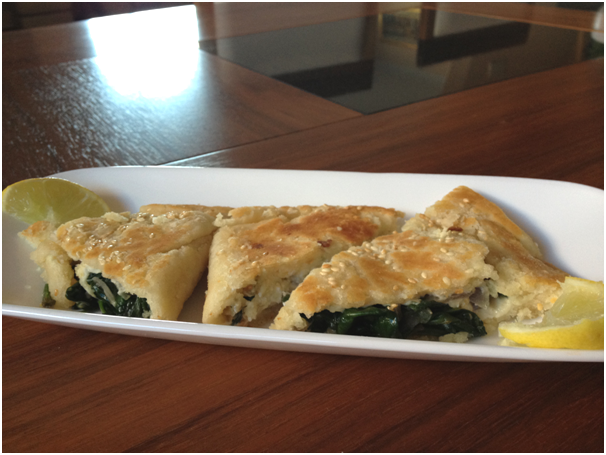 That restaurant looks delicious but, not as delicious as that spinach and feta pide! Yum!! What a great restaurant review! I swear, I am just going to follow you around and eat one day. 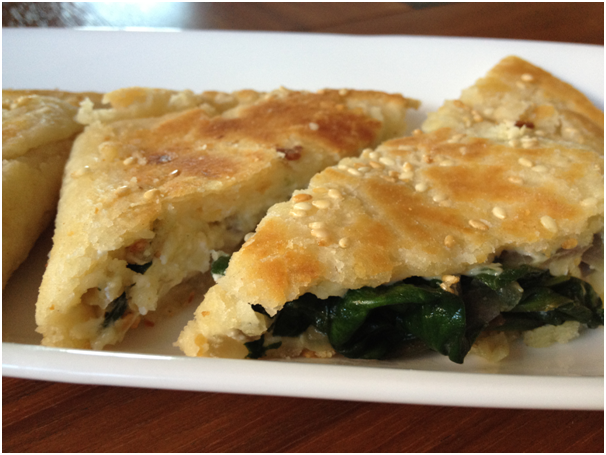 I’ve never heard of gözleme before, but it looks fabulous. 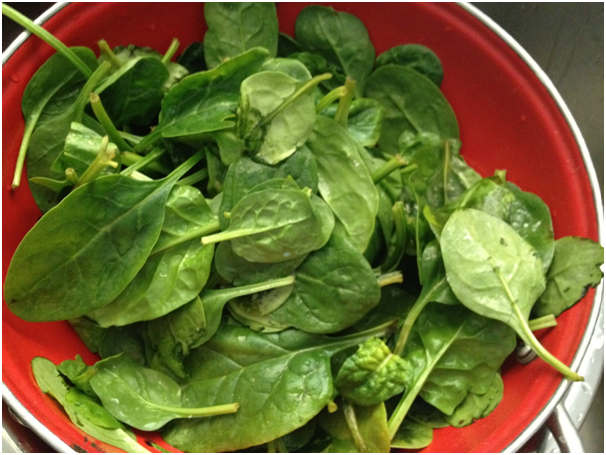 You know I love all that spinach! What great writing at the beginning of this post…I was enthralled to see where your story lead! And what a fantastic restaurant it did lead to…all of that amazing food is right up my alley…if I just lived in Australia…sigh. But we do have a new Persian restaurant close by and now I must go check it out. Cheers! Perfect post! Great music, great capture, great review, and great recipes! I agree on that cool looking carafe/jug/pitcher! I have pinned it I want one so bad. And although the entire meal looks fantastic, I am going to search for or create a recipe for that cauliflower and corn! 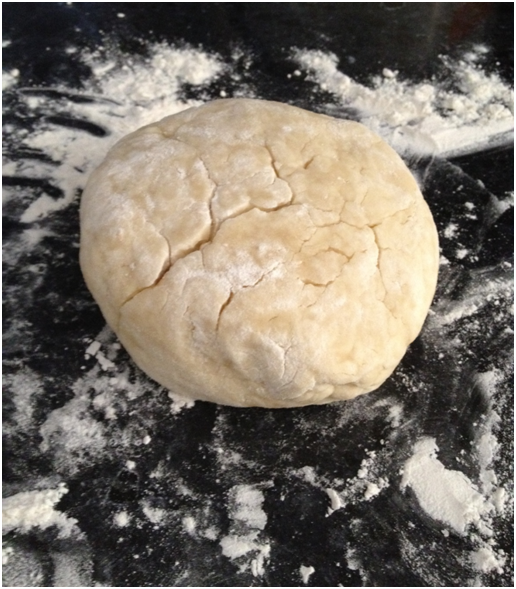 And I look forward to seeing that recipe because there is no doubt you are capable of making it – yum! Thoroughly enjoyed this post, what a delightful family outing, that restaurant sounds like a place I would very much like to visit. 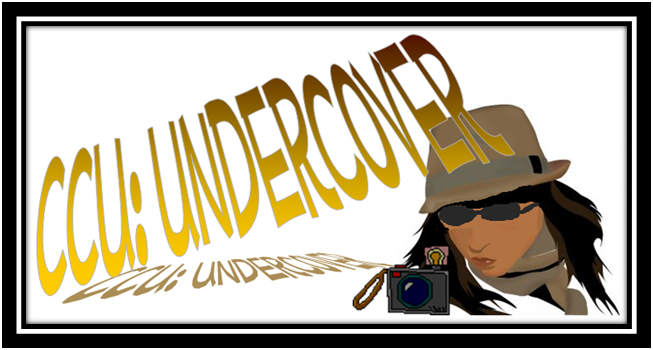 Love your undercover reviews! And you’re so welcome, I love your butterscotch pudding recipe! 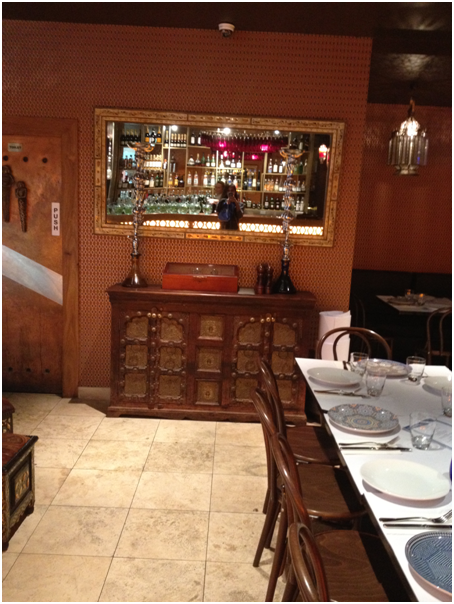 Love middle eastern food, looks delicious and the decor is beautiful. Your spinach pie makes me drool! What an awesome review! I wish we had a Turkish restaurant like that in Toronto. 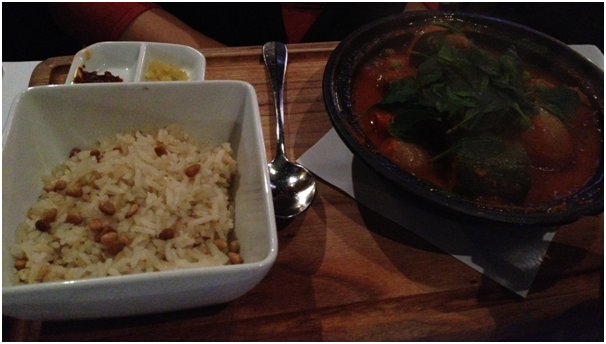 The food looks incredibly delicious and I love the mint in the water pitcher. Everything looks fantastic, and I’m glad it inspired you to make more fun things! Haha, I like how you go all hard-core CCU Undercover 🙂 And your spin on the meal looks delicious, just like the dinner! Looks and sounds like a great restaurant. Your cookies look fab too. And I think I have missed your secret cookies.. so I am going to check them out now! What an amazing dinner out! 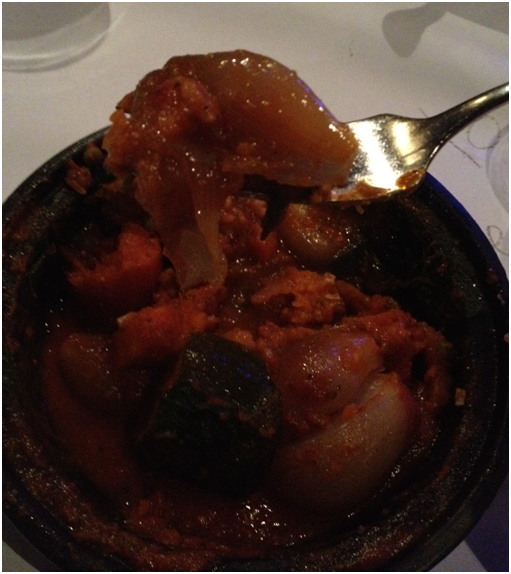 I have never been disappointed by a Middle Eastern restaurant- there are just the most amazing flavours in there! Such a nice dish you made your dad too. And those cookies, YUM! Yum! The place you ate looked wonderful! What is eggplant jam? The spinach recipe looks very difficult but the cookies – oh my goodness!!! YUUUUM GURU I’M THE FIRST COMMENT YAY! !